I've said this before, but I absolutely love making salads. I just think it is so fun to play around with mix-ins and come up with fun dressings. My previous favorite has dried cranberries, pears, pecans, and goat chese. My NEW favorite is this one. When my mother-in-law asked me to bring a salad to Easter lunch, I was excited to come up with something fun and different. As I perused Trader Joe's, the salad started to take shape I picked up some stilton with apricots and decided to go for an apricot/raspberry combo. So I bought some fresh raspberries and dried apricots, found some pea shoots that were lovely, and I threw those in as well. I love having toasted nuts in my salad for the crunch, so I used toasted pecans. And finally, I made a quick apricot mustard vinaigrette. The resulting salad was light, refreshing, and delicious. I loved the sweetness from the fruit, the crunch from the pecans, and the bite from the vinaigrette. While the Stilton was much milder than I expected, it actually worked out better. This way, the cheese didn't overpower the other mild components of the salad. In my opinion, the flavors and textures are just perfect, and I'm already looking forward to making it all summer. Combine the greens in a large salad bowl. 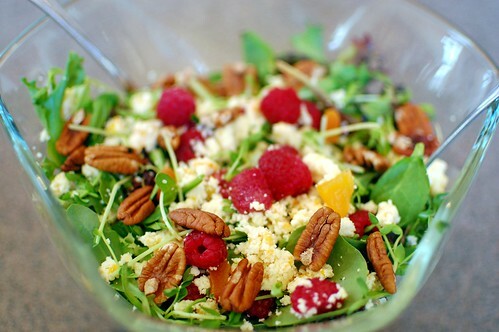 Top with raspberries, pea shoots, pecans, crumble cheese, and dried apricots. For the dressing, whisk together all the ingredients except oil. While continually whisking, stream in the oil until desired consistency. Toss with salad or serve on the side. I love all the colors and textures going on in this salad. I used to work at a deli that sold stilton with apricots and it was one of my favorite cheeses. I always ate it plain and it never occurred to me how awesome it would be in a salad! Oh, how pretty! Love the colors and textures. The dressing looks amazing!! I love creating new salads and dressings at home. You can get so creative. This looks great and so Springy - will definitely be trying the apricot mustard vinaigrette. Yum! This sounds wonderful and definitely looks pretty enough to grace the table for Easter. Nicely done! Wow! This looks so good. I have been on a salad kick with fruit and this sounds wonderful. I love salads with fruit and this is just up my alley! This looks beautiful and sounds delish! Mmmm!! I love apricots! I've never thought about putting them in my salads :) Great idea! That sounds really original! I'm going to try this, but I will caramelize the pecans and see how that turns out in this salad! Lovely photo too! This is the healthiest way to enjoy the easter, I wonder if you have more recipes like this one.